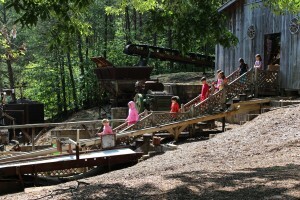 Come see the only working stamp mill in Georgia! This Stamp Mill dates back to the 1800’s. It has been used at several mines in the Dahlonega area as well as in other states. It was placed on the site in the 1960’s. This Stamp Mill has ten stamps with each one weighing 450 lbs. each. The purpose of the Stamp Mill is to crush gold bearing rock into sand so that it can be processed. The Stamp Mill is a very simple machine. The flywheel builds momentum to turn the cam. The cam lifts the stamps and then gravity drops them back down at a rate of 40 times per minute. It can process approximately 1 ton of rock per hour. There are several ways to power a Stamp Mill. One way is a water wheel. Another way is a steam engine. Or as we use on our Stamp Mill, a chain driven electric motor. When the Stamp Mill is in operation you can hear it a mile away. In the earlier years the Stamp Mills ran 24 hours a day. So if you lived near one of the mines you didn’t get much sleep. When the Stamp Mill was being used commercially the two tables in front of the batter boxes would be covered with mercury to catch the gold. We no longer use chemicals at our mine to process the ore.
Due to the fact that oil makes gold float, we can not use oil on the Stamp Mill so we substitute oil with sorghum syrup we have to apply the sorghum syrup daily to the camshaft. The price memorial building at the North Georgia College has 16 ounces of gold on the dome. The Crisson family donated 3 ounces. The Georgia State Capitol has 43 ounces of gold on its dome. The Crisson family donated 13 ounces of gold. The gold was found using this Stamp Mill. Have a good experience at Crisson? Tell others how much fun it is to get the best gold in Dahlonega!